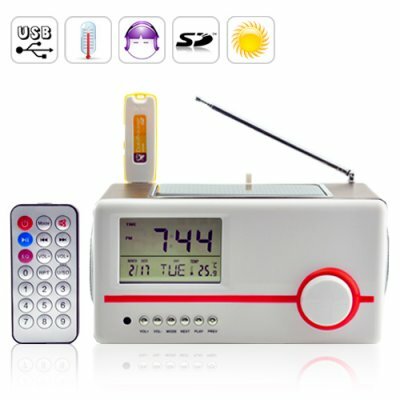 Successfully Added Solar Mini Speaker Charger + MP3 Player + Alarm Clock to your Shopping Cart. A super Solar Mini Speaker that does it all. It effortlessly takes the sun's rays and saves it to its internal lithium-ion battery. It's an awesome PC speaker that works great with laptops, MP4 players, and other portable devices. This baby also plays MP3 files from USB flash drives and SD cards! It's an alarm clock with temperature data. It even charges your cellphone! It even comes with a free remote control! Powerful and Practical: As long as the sun is out or there's a bright light source, this mini speaker will continue to function. Better still, it saves whatever excess energy it can't use into its built-in internal lithium ion battery. Still better is that you can power and charge your cellphone or other portable devices with this amazing solar mini speaker! It Loves to Do More: Aside from incorporating S-2-O (Solar To Output) technology which allows you to solar charge your portable devices, The Solar Mini Speaker Charger also comes with an alarm clock and even displays the current temperature! Best of all is the sound output from these mini-speakers! Surprisingly powerful and stunningly clear, The Solar Mini Speaker handles deep bass and sharp tones like a pro for a brilliant stereo performance of the highest highs and the lowest lows everytime! Hear them for yourself and you'll agree that this baby sounds better than speakers double or triple its price.